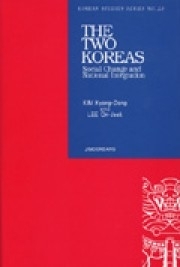 A uniquely collaborative work of two sociologists, one specializing in the studies of North Korean society and the other focusing on South Korean development, this is a first English volume specifically dealing with social change in the two Koreas relative to the issue of national integration, using empirical data analyzed and interpreted in terms of unique theoretical views of modernization. This volume may well be utilized as a helpful reading material for an advanced course on social change and modernization in the two Koreas. In the long run, it can also serve as a useful empirical source for the historical study of the 20th century Korea. 북한 사회를 전문적으로 연구하는 학자와 한국 사회의 발전에 초점을 맞춰 연구하는 학자, 이 두 사회학자의 공동작업을 통해 저술되었다. 이 책은 통일 문제, 경험적 데이터 분석, 근대화에 대한 독창적 이론을 통해 두 한국의 사회적 변화를 다루었다. 또한 두 한국의 근대화와 사회 변동에 대해 논의를 진전시키고자 할 때 도움이 될 것이다. 거시적인 관점에서 이 책은 20세기 한국을 이해하는 통계 자료로서 활용될 수 있을 것이다.